my sweet sister-in-law beth encouraged me to make sure i was writing about everything that was going on in my mind and in my heart. 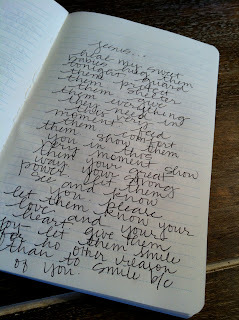 so i have began to journal in a lonely aqua journal that has become a letter to my boys. the boys i don't yet know. the hugs i have not yet received. the kisses i have yet to give. the boys that have grown attached to my heart... my heart that is broken. its the end of yet another week. a week we thought we would receive an email. small tokens showing us that these sweet faces are ours. heal my sweet babies. hug them tonight. guard them. protect them. shelter them. give them everything they need in this very moment. feed them. comfort them. show them you in this very moment. show them your great way. your strong power. let them see and know you. please let them know your love and your heart. give them joy- let them smile for no other reason than to smile because of you. in all honesty i am tired of waiting... but what am i supposed to do? wait on Gods timing. as hard as that may be, tonight i wait again. God knows who those sweet boys are and what they are doing... hopefully sleeping. as i post this it is around 4 o'clock in the morning. thanks you Jesus for all of my children. I understand... all too well. We have been waiting since 2009. Now with all my health problems, we don't know if it will ever happen. We had to turn down "our girls." Day by day, I am surrendering my dream and learning to yield to God's dream for our family. I pray that you will grow in patience and know God's perfect peace, and trust that He has a plan.